Goodreads: The third in the cycle of novels that began with The Shadow of the Windand The Angel's Game, The Prisoner of Heaven returns to the world of the Cemetery of Forgotten Books and the Sempere & Sons bookshop. It begins just before Christmas in Barcelona in 1957, one year after Daniel and Bea from The Shadow of the Wind have married. They now have a son, Julian, and are living with Daniel's father at Sempere & Sons. Fermin still works with them and is busy preparing for his wedding to Bernarda in the New Year. However something appears to be bothering him. Daniel is alone in the shop one morning when a mysterious figure with a pronounced limp enters. He spots one of their most precious volumes that is kept locked in a glass cabinet, a beautiful and unique illustrated edition of The Count of Monte Cristo. Despite the fact that the stranger seems to care little for books, he wants to buy this expensive edition. 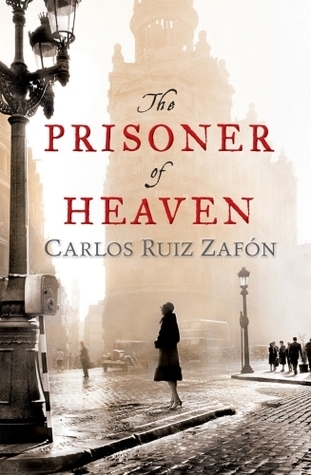 Then, to Daniel's surprise, the man inscribes the book with the words 'To Fermin Romero de Torres, who came back from the dead and who holds the key to the future'. This visit leads back to a story of imprisonment, betrayal and the return of a deadly rival. Kritters Thoughts: The third in a sort of series that made me fall even more in love with the characters and the setting of this bookshop in Barcelona. With repeating characters, this book was easy to get into and even harder to put down - I loved revisiting some of the characters at a different point in their lives and seeing what they were up to at this moment. The setting of this bookshop in Barcelona and the people who work and visit there always has a little bit of underlying tragedy and mystery. I think that although this was the shortest of the three, it had the most bang for the buck. There was a lot of content and not too much extra mess to get a reader confused. Out of all three books in this kind of series, I think this was my favorite, easy to follow the characters as they wove in and out of past and present trying to figure out the details to all of the questions hanging in the air - it was my favorite so far! This review may be short and sweet, but so was the book! Thursday, July 12th: Book Him Danno! I have heard such great things about this book. I have the others so I must try to start this seris, this year is the goal. I'm glad you enjoyed this latest from Zafon! Thanks for being a part of the tour.